Online fire training, online fire marshal training, online fire extinguisher training, online fire awareness training and also tailored fire marshal trainng online based on government booklets, British Standards and published fire service notes. City Fire Training provide online fire training, online fire marshal training, online fire extinguisher training, online fire awareness training and also tailored fire marshal training online websites. In addition to single courses, we also provide bespoke and tailored online fire traiing website for small and large organisations. Our courses are accredited, so you can be sure of great and easy to understand training. Our tailored and bespoke packages can include your fire emergency plan and also your fire evacuation procedures. You can pick from standard workplace online fire training courses or you can also have your own online fire training website. In addition, the site will be only for your staff. Employees will also have unlimited use of their fire marshal training online and general staff website. Managers of small workplaces can buy single online fire marshal training courses. Also available are online staff fire training courses. So what’s the cost? It is just £20+vat per person per course. Great prices and also easily booked. Larger workplaces can have their own tailored fire training website. So only their staff can use the website. They can also opt for a bespoke fire training website. Courses include your own fire emergency plan and also fire evacuation plans. Tailored and also bespoke websites include fire training marshal online and staff fire training courses. If you would like to either call or email us….contact us now! Our online fire marshal training course is either four or six lessons long! Pick a single use course and you will learn about maintenance of fire precautions and fire drills, fire extinguishers, hazard spotting and also accounting and evacuation. If you select a tailored or bespoke website for your staff, we will add your fire emergency plan and fire evacuation plan. Only your staff will be able to access your tailored or bespoke fire training website. Sounds expensive doesn’t it? Well it isn’t. You can train up to 100 people as many times in a year as you wish for under £500+vat. Ask about our fire marshal training online courses. Need online fire extinguisher training? Look no further. 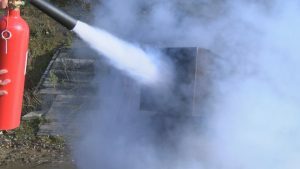 Our approved online fire extinguisher training (general staff course) is just two lessons. However, we can add fire emergency plans and fire evacuation procedures so your staff get to know everything they need to know about fire safety in the workplace. Our online fire training, online fire extinguisher training and online fire marshal training includes certificates of completion and training notes. Online fire awareness training is a quick way to make sure your staff understand fire safety in their workplace. Our fire awareness training online has simple videos and text. After each lesson you will take a quick test. Once you have passed all of the lesson tests you will receive your online fire awareness training certificate. Book an online fire training course and we will refund your fee if purchase a tailored or also a bespoke fire training package. Is your online fire marshal training accredited? Yes. As an approved fire training centre all of our online fire training courses are accredited with the IFSM. What is the difference between bespoke and tailored fire marshal training online? Our tailored courses include our general online fire marshal training course plus two additional lessons using your fire emergency plan and fire evacuation procedures. This is the cheapest way to provide online training for your staff. Bespoke training is 6 different lessons about fire safety in your workplace. The video lessons will be shot in your workplace and will include your staff as actors in the lessons. This is the most effective way of getting staff to carry out online fire training!! How long does an online fire marshal training course take to complete? Most users can complete an online fire marshal training course in about an hour. Users can start a lesson and then come back and complete other lessons at different times. They can also use the site as many times as they like during the time of their license. Is fire marshal training online regarded as acceptable by the fire service? Some fire marshal training online courses are generic and may not be acceptable unless used with other formats. We recommend that our one off courses are carried in conjunction with reading the workplace fire emergency plan. Our bespoke and tailored courses include “your workplace” fire plans and evacuation plans, so will be regarded as suitable. What is different about your online fire marshal training courses? There are a lot of others on offer! There are lots of organisations offering online fire marshal training, online fire extinguisher training, online fire awareness and other online fire training courses. Our fire marshal training online courses can be tailored to your workplace or building. We can offer you a tailored website for your staff. This means they will few are regular online fire marshal training course plus two further lessons. These will be your fire emergency plan and evacuation plan. Alternatively, we can come to your site and film in your building and use your staff as actors. Our research shows that more persons conduct the training and quicker than other options! Is your online fire training course suitable for theatre staff? Theatres are considered to be high risk premises. This is because there is a high life risk. persons will unfamiliar with the building and also that there may be a large number of children, the elderly and disabled persons. Any online fire marshal training should be about the premises. As theatres and similar premises have very specific plans and may have more comprehensive fire emergency plans than other workplaces. Any fire marshal training online courses should be tailored or bespoke to the premises. We are able to provide online fire training courses that include online fire extinguisher training and also online fire marshal training that can only be viewed by your theatre staff. Either call us or email us for more details. Can you provide references for your bespoke online fire training service? We know that offering online fire training websites for staff in quite unique! If you need references from previous clients, we can provide them for you. We want online fire warden training. Can you provide this for us? Fire marshals and fire wardens carry out the same role. We do not title our general fire marshal course as fire warden training. However, if you elect for bespoke training we can change the names etc. We are a fire training provider. Do you offer your packages as resellers? Yes. We can do this two ways. Firstly, we can sell you a number of single general courses. We do offer resellers a generous discount subject to the numbers purchased. Alternatively we can also provide a white label version of our Fire training Course Online website. It will have all of your logos names, pictures and changes in text. You will also get a back office that we will be unable to view. This service is offered on an annual renewal basis. How much does an online fire marshal training tailored package and bespoke package cost? Tailored and also bespoke fire training packages will not cost as much as you would think! Out tailored workplace on-line fire marshal training courses are from £300+vat per year for up to 100 users. That is just £3+vat per person, so is one of the cheapest approved courses that can be purchased. Since it is a tailored package, we include your own fire emergency plan and also fire evacuation plans to our general course. This makes the training courses about your workplace, so will be passed suitable and sufficient by the fire service. Bespoke fire packages will cost a little more. This is because we rewrite our video scripts, will film at your premises and help provide suitable fire emergency plans and procedures. The cost will depend on the amount of work that is required? We will charge an initial fee including the first year and then a small yearly fee.